Readers of this blog will no doubt have independently observed the current and ever-increasing instances of “Orwellian moments” in the speeches, utterings and “new-speak” declarations by regime pundits, or in sundry statements printed on the regime media. “New-speak” is too familiar to require explanations. But as a reminder of other closely linked definitions, “double-think” is the power of holding simultaneously two contradictory beliefs and accepting both of them. In this context, the rulers’ orthodox agent knows how to play tricks with reality; but by practising double-think he also satisfies himself that reality is not violated.A derivative of “double-think” is “black-white”, where black is simultaneously white and vice versa. Orwell’s current scenario is, however, slightly modified from the original. In 1984 it was the responsibility of the rulers’ agent to alter the past to prevent the masses from drawing unorthodox conclusions – but he himself was exempted from believing in his alterations. Today the position of the rulers’ agent is changed. His duty is not only to alter the past, but to believe in his own alterations. Orwell would probably call it “plastic-past”, of which hereinafter is an example – though ominous in its implications. 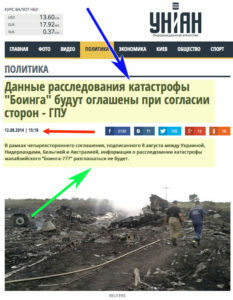 The preceding blog (http://yourdailyshakespeare.com/shakespeare-truth-malaysian-flight-mh17/equalities) dealt with the curious silence of the media after the flourish of tempestuous and loud declarations – immediately after the event – that flight MH17 had been shot down by the East-Ukraine separatists. 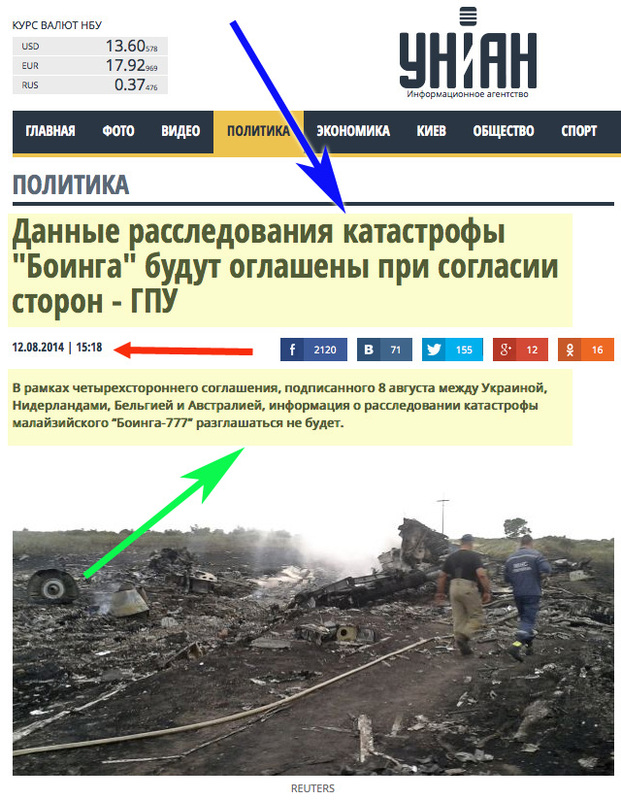 “The given investigations of the accident of ‘the Boeing’, will be announced at an agreement of sides”. The title is sufficiently nebulous to require the reader’s interpretation of what it means. Does it refer to the conclusions of the investigations? If so, conclusions of this type are typically presented at a press-conference, whereas an ‘announcement at an agreement’ is meaningless. The reader – albeit arbitrarily – interpolates and extrapolates. He understands (or assumes) that the investigations are nearing their end and their conclusions will be shortly made public. “By the salt wave of the Mediterranean!” – Antony would say (1) – this is either “an infinite deal of nothing” (2), or, more likely, UNIAN wants readers to believe in this “plastic-past”, mixed with servings of “double-think” and “black-white.” And, if so and by so doing, branding readers as fools. With the further inevitable conclusion that “… he that is so yoked by a fool, / Methinks, should not be chronicled for wise.” (3) For only a fool would consider these assertions tenable, let alone believable, if there was ever intent to explain who shot down the plane and killed 298 people. As I write this, no reference to the Ukraine’s News Agency’ announcement has been made in the Western regime media. Showing the contempt that the same Western regime media has for its followers. The MH17 affair has an eerie echo of what happened after 9/11. For example, The NIST (National Institute of Science and Technology) conducted a related 8-million dollar investigation, including the collapse of building WC-7, which had not been hit by a plane. The results were announced in the summer of 2008. At the first public presentation of NIST’s findings, its director stated categorically that building WC-7 did not collapse in free-fall, as that (free-fall), would imply a lack of any resistance of the base of the structure. Which – unsaid but implied – is what happens in controlled demolitions, when charges are made to explode simultaneously to destroy the supporting function of all the supporting columns. However, a physics professor from Texas was allowed to present his study of the collapse. He had superimposed on the actual publicly available video, the times (in 100th of a second) of the falling sequence. Which showed incontrovertibly that the building crashed in free-fall. However, this was too much even for an Orwellian script. Therefore, three months later, NIST came out with a modification of their findings. Yes, they said, WC-7 fell in free fall, as measured by the professor, but at the same time it didn’t. But how could this “black-white” be possible? Simple, they added 2.5 seconds to the actual measured duration of the fall. In other words, WC-7 started falling before the cameras actually showed it did. Demonstrating that, for determined people, plastic-past, double-think, and black-white, also work in simple physics. Until page 369 there are some redactions here and there (i.e. text blacked out), but not enough to obscure the meaning. However, after page 369, the text of the next 28 pages is completely blacked out. What is the secret contained in the 28 pages? The humble citizen cannot know. But members of Congress can, if they get written permission from the heads of the Senate and House intelligence committees. They are escorted into a carefully guarded room, where, under inspectors’ supervision, they can read the material, but are not allowed to take notes. This entry was posted in Best Shakespeare Quotes, Fighting your Adversary, Historical Quotes, Insults Shakespeare-style, Philosophical, Psychological & Historical Considerations, Polite Insult, Presentation Ideas, Shakespeare and Politics, Shakespeare in Politics, Shakespeare Invocations, Social Exchanges Shakespeare style, Uncategorized and tagged After Dinner Quotes, best shakespeare quotes, good answers, presentation ideas. Bookmark the permalink.